Having just moved across the river to Cambridge I am always on the scout for new, fun places to spend those long summer nights. My favorite outdoor location is currently the rooftop terrace of Daedalus, located right in Harvard Square. Friends of ours know the owner and get their free beers served at the outdoor cedar tables. From this vantage point one can gaze up at the summer stars through the treetops without the distraction of the noise and bustle of the street down below. Go up to the bar and order a well-made gin and tonic or request something "fruity" from the bartender. He might recommend a mean coconut Mai Tai his fellow bartender makes with Malibu rum, pineapple juice, a splash of grenadine all drizzled with a little dark rum. "It's deadly." he warns as you take in the mellow lighting of the third floor bar. For nights when the rain keeps me from venturing out too far, my favorite indoor spot becomes Dali's, located just across the Cambridge/Somerville border. Walk through the cave-like entryway and you are transported to an atmospheric tapas bar in Spain with a surrealist twist. Vines of garlic and dried chilis hang from the ceiling along with a variety of odd acutriments straight out of a Dali painting. Share a pitcher of delicious sangria served up at the bar along with a selection of tapas. The candlit room has a warm, romantic feel, possibly due to the red painted walls or perhaps it's the distinctly Spanish bar staff and clientele. Jewelry making has been a hobby of mine for the past few months. I do it mainly to distract myself from the grim reality of graduate student life. Somehow, making a nice-looking necklace or a particularly dangly pair of earrings offsets the unfathomable panic that bubbles up each time someone asks, "So, when do you graduate?" Recently I was overcome by an odd surge of goodwill. I got an email from a friend regarding a fundraising event in which beads from South America would be made into jewelry that would then be sold in a silent auction to raise money for the people who made the beads in the first place. They were looking for beaders to make the jewelry. We would buy the beads and then have three weeks to make a necklace for the event. I'm all for supporting the local people and so I signed up. We arrived at Spark Craft Studio ready to see a wide selection of funky ethnic handmade beads. We were met by the lovely, Maria, a young entrepreneurial type with the most amazing sense of optimism. Her ideas about bringing the proceeds back to the local community and supporting local jewelers were admirable. Why would you want to buy a mass-produced item that hundreds of other people will also buy when you can have something unique and handmade? It's not that I have anything against bright orange or blue, or even anything against what looked to be some sort of polymer bead one might make in grade school. It's just not my style. At all. I hoped that perhaps other people would turn up and it wouldn't be just me and my friend shouldered with the responsibility of making ALL the necklaces for this fundraising event. Eventually, the guilt overcame me and I bought $16 worth of these clay beads. It was all the money I had in my thin little wallet (Maria only took cash.) Spark Craft Studio was nice enough to give us a store credit of $10 for participating in the fundraiser. I was going to need all the help I could get. I hoped that by the time I got home, inspiration would strike. One week later and the beads are still sitting on my diningroom table. Mocking me. Who will win this battle? Me or the beads...only time will tell. 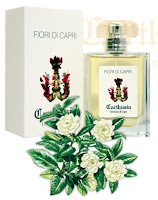 My favorite perfumery of all time is located on the beautiful island of Capri. The stone path leading to the shop is lined with blossoms of the most incredible fragrance. Legend has it that in 1380 the father prior of the Carthusian Monastery of St. Giacomo in preparation for the arrival of Queen Giovanna D'Angio to Capri made an arrangement of local island flowers. The water was not changed for three days until the prior noticed this water had acquired a lovely fragrance. That water became the first perfume of Capri. During my morning web perusal I came upon a link for 3 Doves Jewelry, a company developed by Kristine and Lara Zizic that features handmade pieces with elements of nature in brass, gold, coral, lava and gemstone. 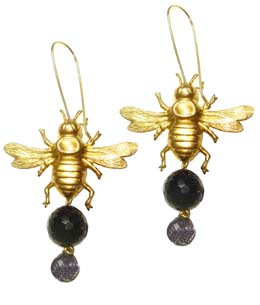 These little brass bumblebee earrings look quite familiar to me as I think I've used stampings from the same mold. A friend of mine has recently moved into the realm of gemstones as well. It's certainly one way to break into the high end market! 3 Doves Jewelry is sold online and at several boutiques across the country, including Stil on Newbury Street here in Boston. I wonder if the Zizic sisters started on etsy? Some mornings I’ll hit the snooze button for up to an hour or two. Not unlike other bad habits such as smoking or drinking, snoozing is one hard habit to kick! 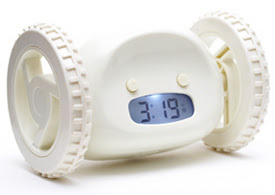 If you’ve ever had trouble waking up in the mornings, perhaps this little clock is just the thing! When the alarm goes off, Clocky will roll off your bedside table and wheel away, randomly bumping into objects on the floor until finding a suitable spot to rest. The alarm will sound again and you, the over-sleeper, will have to get out of bed in search of your runaway alarm clock. After much anticipation, Clocky, an academic research project designed by Gauri Nanda of MIT, has finally become commercially available. Clocky was originally outfitted in brown shag, but now has a newer, slicker exterior. To be honest, I miss the brown shag! 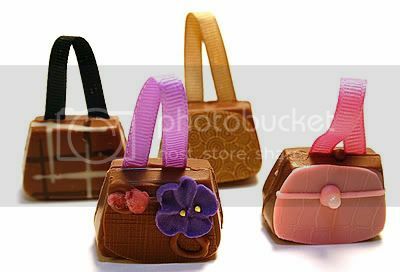 Maybe soon they'll come out with a furry covering for Clocky, in which case I may have to spring for the new model! In 1888, naturalist, John Lubbock observed that experimentally intoxicated ants would be picked up by nest mates and carried home. Drunken stranger ants would be tossed in a ditch. In order to regulate beer quality, ancient Babylonians, decreed that any commercial beermaker who sold unfit beer would be drowned in his/her own libation. People who weigh less or have a higher percentage of body fat are more affected by alcohol. This past Saturday I had the opportunity to try out Boston's American Beer Fest held at the Cyclorama in the South End. Beer Fest, sponsored by the Beeradvocate, happens several times a year. 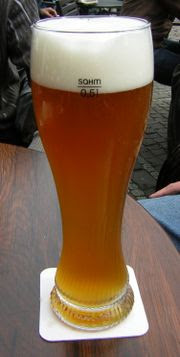 The Fests generally have themes (lagers, Belgium beers, unusual beers etc...) and on Saturday the theme was wide open. Brewers from all over the United States gathered together to showcase a few of their trademark brews, from light German style Hefe Weizens with hints of banana or clove to chocolate or coffee-infused stouts. Beer lectures were held on the side for those wanting to take a break from wandering around the various stalls and a selection of appropriately heavy foods were available to help soak up the beer. My all-time-favorite was the freshly made Belgium waffle, served warm, thick and chewy with a layer of carmelized sugar embeded in the crust. Being a woman who loves beer is often a trying experience. Fruity cocktails are ok every once in a while, but a nice cold beer is generally my preferred evening beverage. Often my appreciation falls on deaf ears if I'm in the company of other girls, but every now and then I run into fellow female beer aficionados. At Beer Fest this year the percentage of women astounded many. Where did they all come from and what were they doing here? Based on the extraordinarily long lines for the women's restroom I would conclude that yes, women do appreciate beer! The idea behind the (product)RED campaign is to use our buying power to try and make a difference in the world. A number of brands have teamed up with the Global Fund to generate funding for some of the initiatives aimed at reducing the rates and effects of AIDS, Tuberculosis and Malaria. The Global Fund partners with governments, non-profit organizations, and the private sector to work towards ridding the world of these devastating diseases. Its sole purpose is to raise funds for the countries, organizations and communities that need financial help to allow them to respond to these epidemics. A lofty goal, for sure, but I figure, if I'm going shopping anyhow, why not give them a hand? 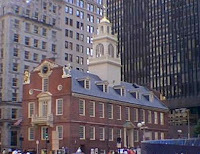 Last night I had a dream in which I was writing a blog about the Old State House in Boston. In my blogging dream I woke up, thought about my blog dream, and started writing a blog about the Old State House in Boston. In other words, I dreamt of blogging about the Old State House TWICE in one night. My boyfriend says this makes me a square, but I think it's a sign that I should indeed write a blog about the place. 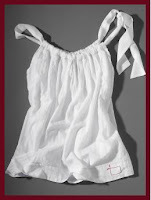 We have a friend who works at the museum in the Old State House and she often laments the fact that so few people know and appreciate this valuable piece of history. The Old State House, the oldest surviving public building in Boston, was built in 1713 to house the government offices of the Massachusetts Bay Colony. It stands on the site of Boston's first Town House of 1657-8, which burned down in 1711. There is in fact a museum one can visit inside the building (I know this because my friend works there!) and although I have not yet stopped by, I am thinking a little historical education wouldn't hurt. I think I may go have a cup of tea to celebrate our country's historical pride. One of my favorite shops in Allston is an adorable little spot called Pixi Accessories. Run entirely by cute little asian girls (or so it seems!) this place is filled to the brim with unique dresses, tops and skirts that are all fun, funky and fashionable. Unlike at some other trendy boutiques, one can actually afford the clothes tried on at Pixi (even if you are on a graduate student stipend!) Pixi Accessories also carries an array of retro shoes and hats along with a surprising collection of sparkling costume jewelry. Here is the place to buy a gaudy gold and faux pearl necklace à la Mode or a set of ridiculous hoop earrings. Personally, I am drawn back every time for the pretty little summer dresses in vintage-style fabric and the brightly colored flowing tops - perfect for the season! If only they sold online! My latest favorite website is one I discovered through Pequitobun, so this is also another plug for her! Rare Bird Finds is a fabulous shopping blog featuring all sorts of unique gifts and treasures. From jewelry to housewares to stationary and clothes -- this website has it all and tells you where to buy it! 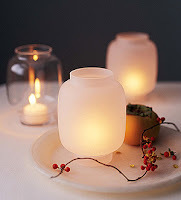 I love this cool-looking sea urchin lamp. Of course, it's totally impractical (imagine the terror of trying to dust this item...) but blogs don't have to be about practicality, do they? Temper serves an excellent selection of teas and espresso coffees as well as delicious European style hot chocolate for you to sip while wandering through the elegant Commonwealth Hotel lobby shops or lounging in one of the decadent brocade chairs. Check out the website for a menu and event listings! Just down the street from my new digs is a small little gourmet market that Julia Child once frequented back when she lived in here in Cambridge. I walked past Savenor's a little before 9am when the place opened and drooled over the precious cooking oils, imported dried mushrooms and glass jars of spices lining the windows. On the way back from the more affordable Market Basket down the road, I was tempted by the cheese display beckoning from the entrance and returned to peruse the gorgeous produce section of this beautiful shop. There were picture-perfect tiny pearl onions and bright red vine-ripened tomatoes, fresh Belgium endive and Bibb lettuce. However it was the unbelievable meat section that really caught my eye. Ostrich and kobe beef patties and rack of lamb - bright red cuts all worthy of any Julia Child menu! In the refridgerated case sat tubs of black and white truffle flavored butter, ice cream from Herrel's and other delicious treats. 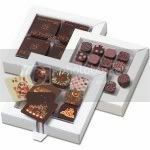 The impressive gourmet chocolate display featured tastings form around the world, while the dried pasta section came mainly from Italy.